Office Location: Building T, Level 2. My paper on "Cooperative Automated Vehicles: a Review of Opportunities and Challenges in Socially Intelligent Vehicles Beyond Networking" has been accepted in IEEE Transactions on Intelligent Vehicles! See the full preprint here. I am now in the editorial board for the Sensors journal in the Internet-of-Things section. Our (Yousheng Zhou, Chujun Wu, Qingyi Zhu, Yong Xiang and I) paper on "Rumor Source Detection in Networks Based on the SEIR Model" has been accepted in IEEE Access! Our (Majed and I) Work-in-Progress (WiP) paper on "A Two-Layered Task Servicing Model for Drone Services: Overview and Preliminary Results" has been accepted (and will be presented Percom 2019, in Japan, thanks to Jon and Wei, RMIT colleagues) See the full paper. Our (Majed and I) paper on "On-Drone Decision Making for Service Delivery: Concept and Simulation" has been accepted (and will be presented at the Workshop on UNmanned aerial vehicle Applications in the Smart City: from Guidance technology to enhanced system Interaction (UNAGI) held at Percom 2019, in Japan, thanks to Jon and Wei, RMIT colleagues) See the full paper. Our (with Flora and Salil) article on Algorithmic Guardians has appeared in the Conversation! Our (Jurairat and myself) paper on "A Review of Mobile Crowdsourcing Architectures and Challenges: Towards Crowd-Empowered Internet-of-Things" has been accepted for IEEE Access! Congratulations to Dr. Amin BakhshandehAbkenar on his PhD! I gave a talk on the Future of the Internet of Things in the School of IT, Deakin University - slides here. Paper recently accepted for the Fourth International Workshop on Legal and Technical Issues in Cloud and Pervasive Computing (IoT) (CLaw 2018) at Ubicomp'18, Oct 2018, Singapore! Please click on the image above or find the full preprint in my publications. (2 Aug 2018) Reflecting about recent scientific directions, a lot of my recent work (since 5-7 years ago) can be viewed as pursuing the following line of research on trying to better understand Massive Cooperation for Large Scale Autonomous Systems. I am co-chairing the IEEE International Workshop on Pervasive Context-Aware Smart Cities and Intelligent Transportation Systems (PerAwareCity) at Percom 2019. Congratulations to Dr. Osama M. Barzaiq on his PhD! I am an invited editorial board member of the journal Services. My article on ethical cooperation for self-driving cars has appeared in the Conversation. I am starting a new IoT research group at Deakin - a glimpse of it is here! I am coorganizing the Third IEEE International Workshop on Pervasive Context-Aware Smart Cities and Intelligent Transport Systems at Percom 2018! I am coorganizing the First Internet of Cooperative Autonomous Things (IoCAT 2017) workshop at Mobiquitous 2017! I am industry track chair for Mobiquitous in Melbourne in 2017! 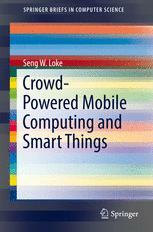 9 March 2017: my new book "Crowd-Powered Mobile Computing and Smart Things" has just been published in the SpringerBriefs in Computer Science series! Get a copy from Springer or from Amazon. Topics covered include cooperative vehicles when vehicles are viewed as smart things, cloud computing, Internet of Things, mobile and wearable computing, crowd computing, the culture of thing sharing, collective computing, and swarm dynamics. The brief is a useful resource and a starting point for researchers, students or anyone interested in the contemporary computing landscape. Check out some recently accepted papers! Since 9 January 2017, I have moved to Deakin University as Professor of Computer Science. If you are a prospective student interested in working with me, please apply to Deakin: apply to Deakin. I am an invited editorial board member of the International Journal of Science and Engineering of Smart Vehicles. I am an invited editorial board member (associate editor) of Springer's Human-Centric Computing and Information Sciences journal. I am an invited editorial board member (associate editor) of the International Journal of Mobile Computing and Multimedia Communications. I gave an invited talk at the Emerging Big Data Technologies Summit (EDBTS) 2016. Program here. I was an invited external scholar at the QUT Information Systems PhD workshops 2016. I visited IBM Research in Melbourne and gave a talk on Crowd-Powered Mobile Computing on 9 September 2016! I co-organized AwareCities at Percom 2016! I co-organized the PhD Forum at Percom 2016! I was an invited panelist at Percom 2016 on "Smart cities, intelligent environments, and dumb people"! I gave a keynote at the CROWDBENCH workshop at Percom 2016! I spoke at ETH Zurich in March 2016 - slides available from IVT ETH Zurich Website. I am Professor (Level E, Full) in Computer Science at the School of Information Technology in Deakin University. I was Reader and Associate Professor at the Department of Computer Science and Information Technology in La Trobe University. 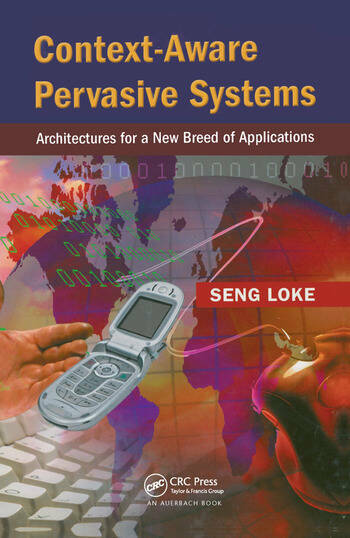 I led the Pervasive Computing Lab at La Trobe, and have authored 'Context-Aware Pervasive Systems: Architectures for a New Breed of Applications' published by Auerbach (CRC Press), Dec 2006, and more recently authored 'Crowd-Powered Mobile Computing and Smart Things' published by Springer. My research has mainly been in pervasive (ubiquitous) computing and mobile computing, Internet of Things (IoT), focusing on issues concerning systems and information, with current emphases on complex cooperation among Things (including smart vehicles viewed as smart things, i.e. Internet of Vehicles, Internet of Drones, Internet of *), crowd-powered mobile computing, mobile Big Data, mobile Big Systems, the social impact of mobile technology innovation, Mobile/Physical Web/Cloud development, and how they might interact. Some of my work can be categorised under mobile cyber-physical systems. I have (co-)authored more than 270 research publications including over 58 journal papers, 10 book chapters, and over 180 conference/workshop papers, with numerous work on context-aware computing, and mobile and pervasive computing. I have been on the program committee of numerous conferences/workshops in the area, including Pervasive'08 and Percom'10 (and 2011). My research has been published in journals such as IEEE Transactions on Intelligent Vehicles, IEEE Pervasive, Knowledge Engineering Review, Pervasive and Mobile Computing Journal (Elsevier), IEEE Transactions on SMC, IEEE Transactions on Cloud Computing, IEEE Transactions on Intelligent Transportation Systems, ACM Transactions on Embedded Computing Systems, Personal and Ubiquitous Computing, The Computer Journal (OUP), Future Generation Computer Systems, MONET, Journal of Systems and Software, Expert Systems and Applications, Journal of Network and Computer Applications and Theory and Practice of Logic Programming. I have also published in leading conferences in the pervasive, middleware, and services computing areas including Percom (CORE ranking: A), International Conference on Service-Oriented Computing (ICSOC) (CORE ranking: A), Mobiquitous (CORE ranking A), International Conference on Web Services (CORE ranking A), HICSS (CORE ranking: A), and Middleware (CORE ranking: A). I completed my PhD in 1998 at the University of Melbourne, and the BSc (Hons) in 1994 at the Australian National University winning a University Medal in Computer Science. I was an Honorary Associate of the Centre for Distributed Systems and Software Engineering, Monash University for several years (2006-2011). See also my always-slightly-out-of-date CV. mSafe: collaboration with Falko Schmid (informatik.uni-bremen.de), Kai-Florian Richter (kfrichter.org), Sara Fabrikant (geo.unizh.ch), Stephan Winter (unimelb.edu.au), Christoph Stahl (dfki.de), Patrick Laube (geo.uzh.ch), Robert Weibel (geo.uzh.ch), Christian Freksa (sfbtr8.uni-bremen.de), since 2012. Last updated, Loke, S.W., 2019.